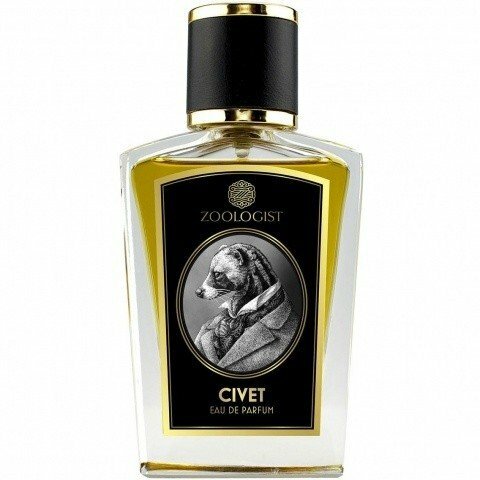 Civet is a popular perfume by Zoologist for women and men and was released in 2016. The scent is spicy-floral. The longevity is above-average. It is still in production. The accompanying text for Civet has again been chosen more than suitable. Imagine, you wander unsuspectingly through the wilderness and enjoy nature, although the weather is a bit oppressive. Near dusk, it suddenly cracks suspiciously in the underground. Branches break, leaves rustle and you hear a soft squeaking and hissing sound. You still walk a few steps before you hear the sounds coming closer. Meanwhile, you stop in astonishment because of a quite strong animal smell and before you realize it you are surrounded by civets, which examine you by eye. Slight discomfort increases as to the number of animals. The first one comes closer, you feel trapped and then.... turns out the little robbers are a little friendlier and safer in my world than in the real world. Again, I had no idea what to expect and am again positively surprised by the pleasant smoothness of the fragrance. The fragrance is compared with a sensual rendezvous at night in the sultry heat of the jungle. I think it lives up to this picture and to its name. Civet creeps slowly to enthrall you and won't let you go again easily. What bothers me a bit is the rather harsh beginning with slightly biting spices and citrus notes. I can't perceive a great animal aura in the scent as with Beaver or Rhinoceros, but here and there little scent marks shine through. That would explain at least the biting character. When spices and citrus fruits settle, opulent flowers emerge, which tend to remain tame despite all the opulence. You may notice their opulence, but it is caught up in a floor of woods, resins and a subliminal, subtle sweetness. On the whole, this gives Civet a coziness in which one can feel comfortable. I'm not mad about that at all. It is not oppressive, it is not obtrusive, it is not a bomb. Everything is moderately balanced. A portable, pleasant fragrance for certain evening hours. As Shelley Waddington announced, Civet is surprising. Hopefully positive for most people. The fragrance apparently completely reinterprets the popular chord of yesteryear and makes it tame and mass-compatible. Some may not find what they are looking for when they read the catchphrase civet, but Zoologist shines again with a beautifully drawn backdrop to an animal that appropriately expands the Canadian zoo. The creation here makes me think of great perfumery classics, recreating perfumes from the glory days of the Civet. The impression I have is as if Shelley had studied the creation style of the great master Roudnitska and understood his creation dynamics. Civet works in a dynamic similar to that of one of the great classics of Roudnitska, Femme de Rochas, also remembering his wonderful Diorama (and also referring to a Guerlain classic that works on a similar dynamic of notes, Parure). All these creations are like a melody that combines spices, flowers, fruity notes and a base with nuances of moss and woods. At last, Civet arrives at its finest moment and you can perceive the bass tone of the idea, a blend of green earthiness of moss with the dry, animalic aroma of the amber and the more creamy, woody scent of sandalwood. And in the background you can finally feel the warm touch and a tiny bit of civet mingling with the resinous and slightly sweet aroma of opoponax and a light powdery touch of iris. It is one of the most complex parts of the composition and one of the moments that often in contemporary perfumery sounds linear and simple. Civet is a masterpiece that preserves the richest and most beautiful in the past and gives a new generation a chance to experience symphonies that otherwise they would not have access to. Write the first Review for Civet!